Want our award-winning Bible studies and articles to continue reaching more and more readers? 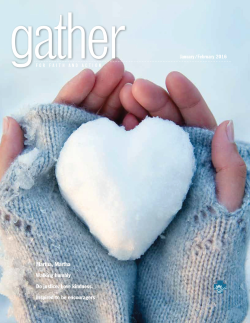 You may now support the publishing ministry of Gather by making an online donation to Gather using your credit card. Every dollar helps continue our work to inspire, support, and mobilize women for bold lives of faith. $25 $50 $100 $250 $500 $1000 or enter donation amount: $ Yes! I would like to make this a monthly gift to Gather. I understand that my credit card will be charged monthly. Gather would like to send you email newsletters and other communications about events and special offers, and occasionally, information from carefully screened partners that could be of interest to you. Yes, I do want to receive updates and offers. No, I do not want to receive updates and offers. CVV Code What is this? M-F 9 AM to 5 PM E.T. © 2019 Gather. All rights reserved.